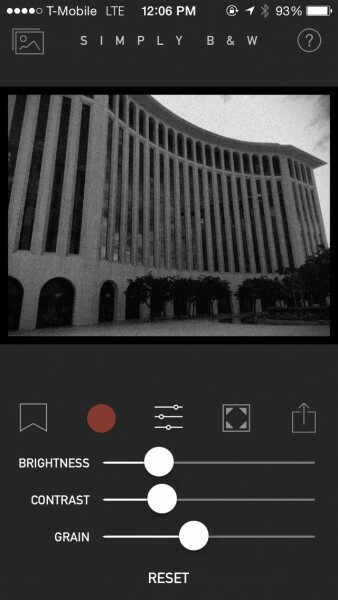 SimplyB&W (Free) by James Moore of Fotosyn is a simple app for turning your photos into classy black-and-white images. Regardless of photography level, SimplyB&W makes it possible for anyone to see reality in monochrome and turn it into a classic. 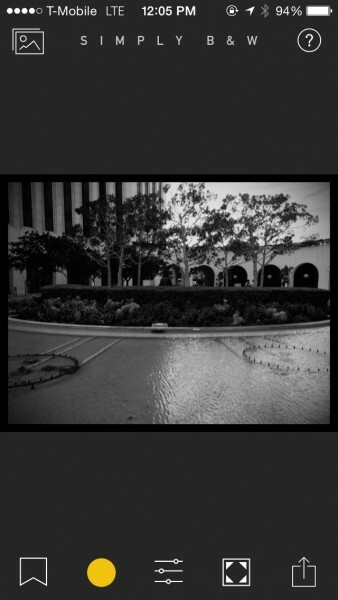 It’s similar to other apps like Hueless, Camera Noir, and Lenka. When I’m not at my computer writing, I like to go out and explore what’s around me, and I enjoy capturing these moments with my iPhone. 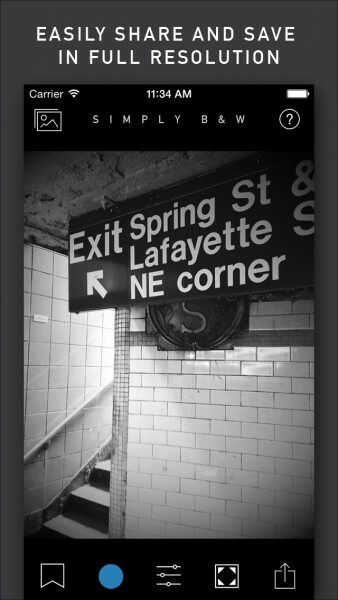 I’ve been doing this ever since the first iPhone, because it has just made photography so much more accessible to me. Even everyday, mundane objects can become interesting if you take a photo in the correct way, which is what I love about photography. To take it a step further, black-and-white images just emit a level of timelessness and elegance to them, making anything seem a bit artsy and meaningful. I typically don’t shoot in black-and-white exclusively, but I do enjoy editing some photos that will fit the mood. So when I first learned of SimplyB&W, I was eager to give it a try. 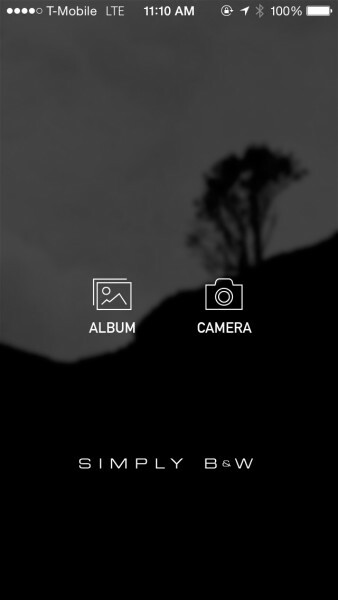 The interface for SimplyB&W is just as the name suggests — simple. 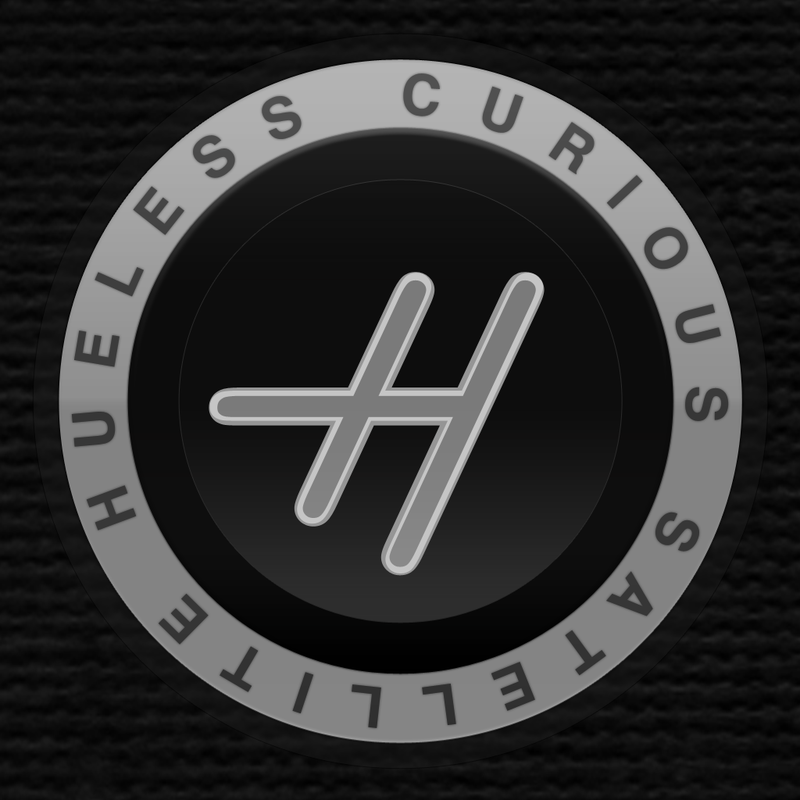 It’s clean, elegant, and intuitive, with no extra frills. 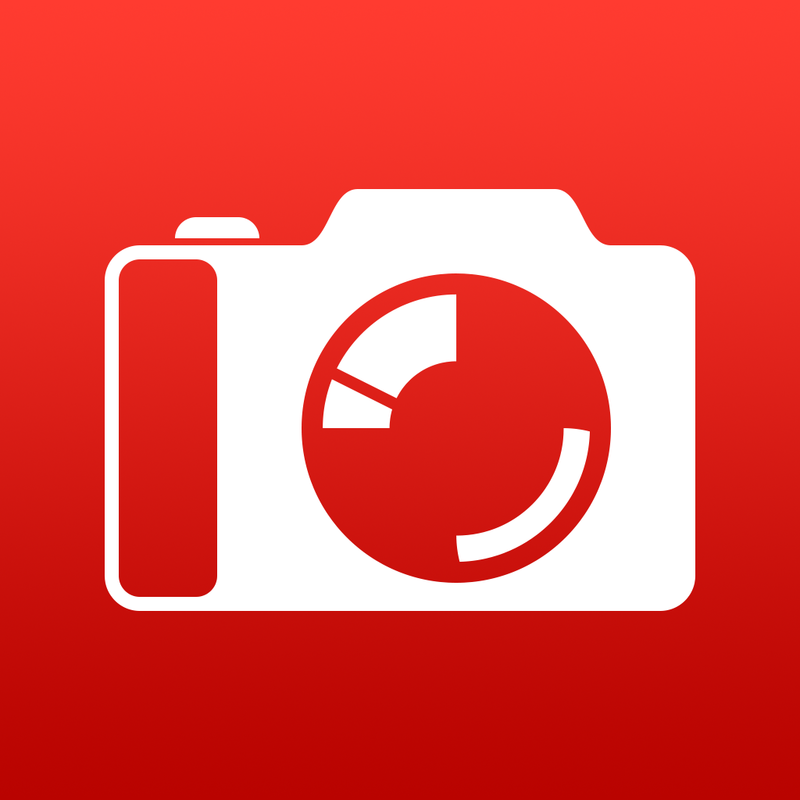 The app focuses on the photos that you’ll be editing, so the design of the app is made to be out of your way, which is nice. There is a classy typeface used for text, and the icons used are recognizable to anyone. SimplyB&W is easy to use, so anyone can pick it up and come up with their own monochrome world in just a few moments. 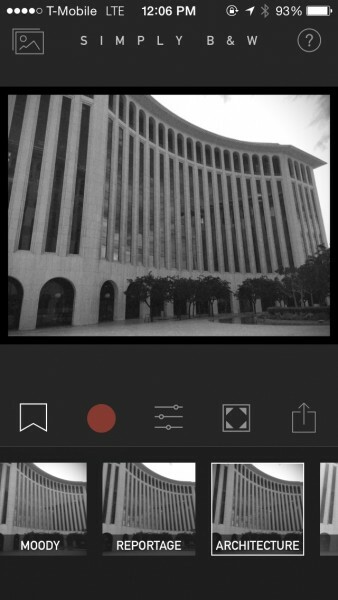 There are two ways of getting images into SimplyB&W: importing from your Photo Library or a new capture. 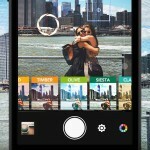 Even if you change your mind on the image, the app won’t get rid of the photo you’ve dumped in until you pick a new one, so you don’t have to worry about losing your progress. 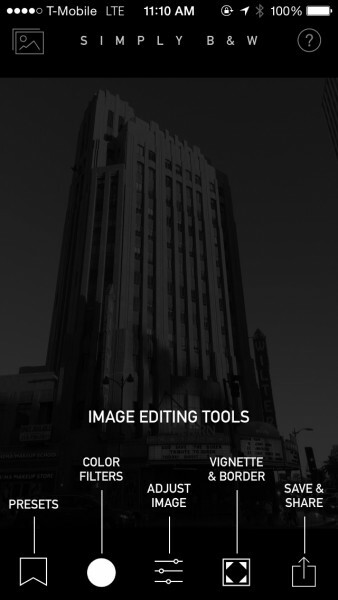 When editing an image, there are four things you can change from the bottom toolbar: presets, color filters, image adjustments, and vignette & border. The fifth button is for saving and sharing your work. Presets are various black-and-white settings that are suitable for different situations. This makes SimplyB&W a bit different from the other black-and-white apps I’ve tried, because those usually just had global settings for black-and-white, which may or may not have worked for everything. In SimplyB&W, you have the Standard preset, but you can choose six other ones, including landscapes, portrait, moody, architecture, and more. 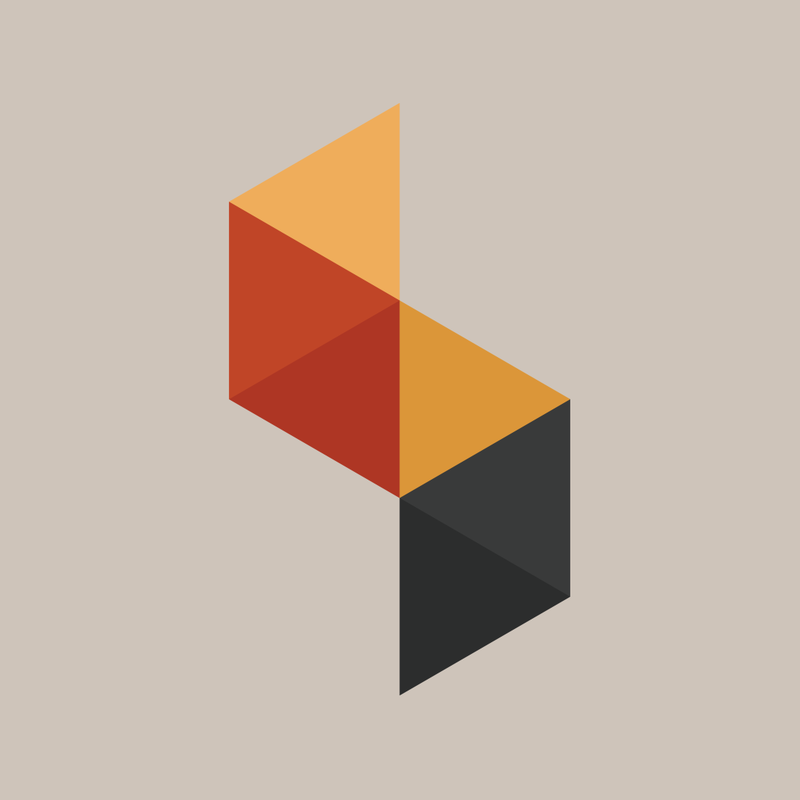 These are nice to have, because they add a nice touch to the image, depending on the subject. 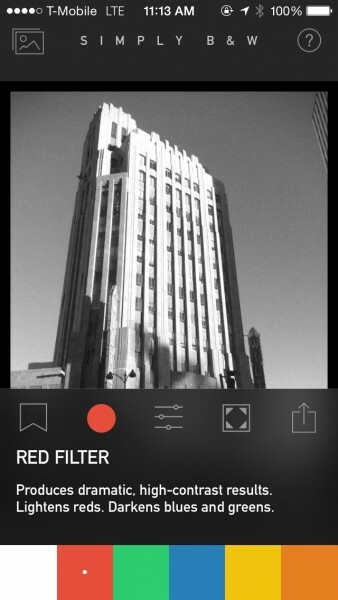 The color filters are there to help refine your black-and-white image. By default, it will be on “No Filter” until you pick one. There are five colors to choose from: red, green, blue, yellow, and orange. Each one has its own use, which are explained as you peruse through them. For example, red will give high-contrast results by lightening reds and darkening blues and greens, while blue will reduce contrast, lightening up blues and greens, and darkens reds and oranges slightly. 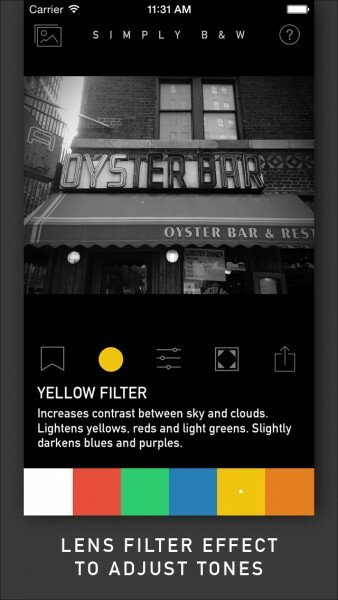 These color filters may seem pretty subtle, but as you go through them, the effects are apparent. 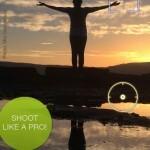 Image adjustments are the basic things that you can tweak in any photo editing app. This includes the brightness, contrast, and grain levels (to simulate real film grain). To change these, just drag the slider to your desired preference. I wish that the sliders were more precise, though, because I notice that they will move slightly once you release your finger, as in most apps. If these could be as precise as SKRWT, I’d be one happy camper. The final thing you can add is a vignette and border. 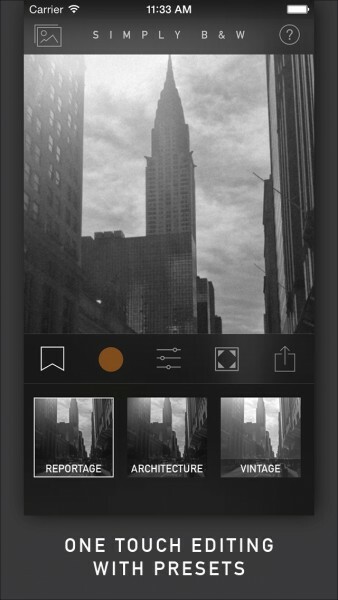 The vignette can be either black or white, and you choose the vignette intensity with the slider. Borders are just a simple black or white frame, nothing crazy like in other apps. Of course, you can even have no border. Once you’re done editing your image into a black-and-white piece of art, you’ll need to save or share the image with others. 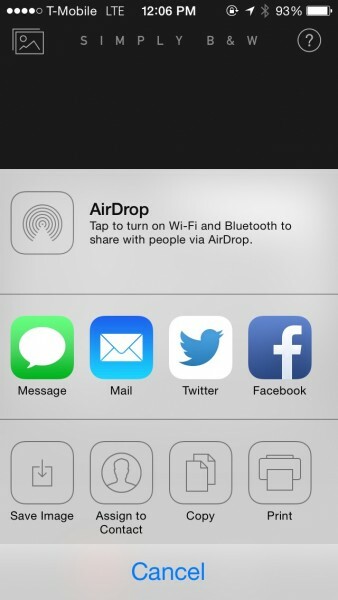 Just tap on the “Share” button, and you can save it to your Camera Roll, or share via the standard Share Sheet. Oddly enough, I didn’t see an “Open In…” option, so if you want to do more editing or send it to Instagram, you’ll have to save it first. I’ve been enjoying SimplyB&W for some time now. 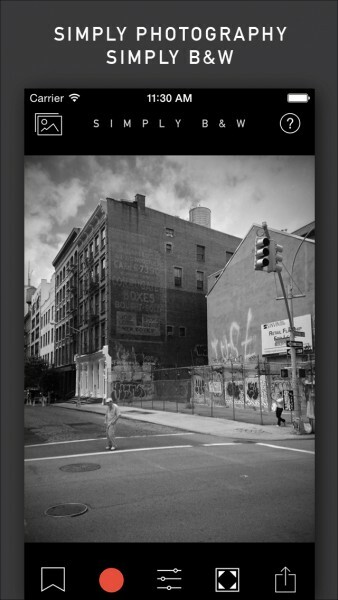 It’s a fantastic little app for easily making black-and-white photos on your iPhone with more customizability than most. I just wish that the sliders could be more precise when you release your finger from the screen, and having an “Open In…” option would be convenient. 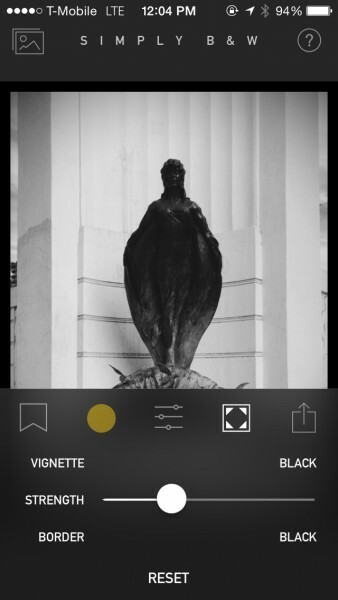 I believe that the presets should cover any image type, but it would be nice to have more added over time, if possible. You can make the presets your own with any changes, though, which is a nice bonus. 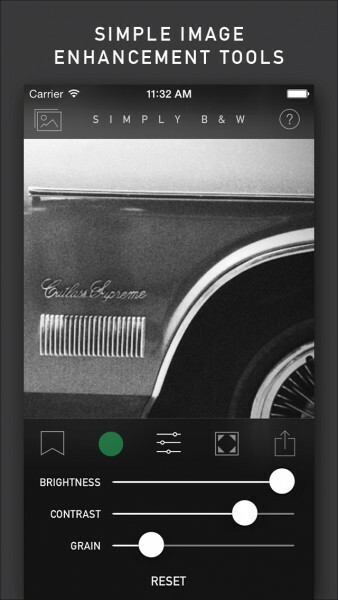 If you are a black-and-white photography fan, or want to get into it more, then this is the perfect app to add to your iPhone photography toolbox. 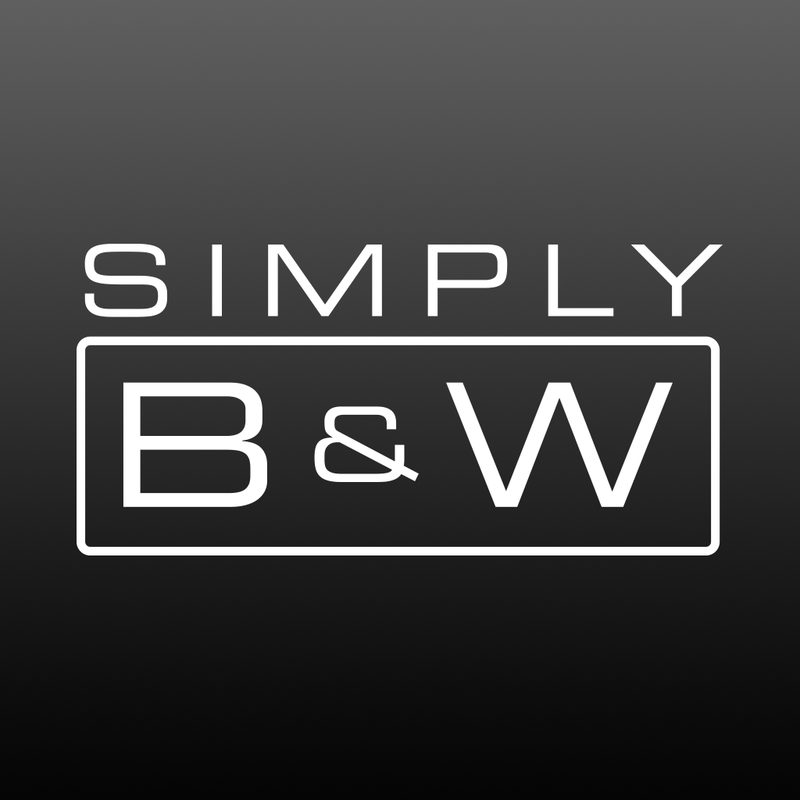 SimplyB&W is available on the App Store as a universal download for free (there are zero in-app purchases).